The world has changed a lot since Congress passed the National Park Service Organic Act of 1916. So have the National Parks. There are tour bus-filled roads, overflowing trailheads, and tame squirrels begging for nibbles of granola. But the parks are also full of craggy summits, miles of pristine shoreline, and hallowed ground that is central to the American experience. Visiting the National Parks is about discovering the magic of place and leaving inspired. It’s about recognizing that these natural and cultural treasures are set aside because we, as a society, value them enough to protect them. A morning run up the Lincoln Memorial should be on every runner's bucket list. It was a 2016 National Park Week highlight for me. A couple years ago, I celebrated the 50th anniversary of the Wilderness Act by running in Montana’s Wilderness Areas. Running wilderness got me up close and personal with mountain ranges I barely knew existed. It also gave me an opportunity to share my love for wild lands with anyone who would listen. This year, I hope to relive some of that experience in a whole new way. I’m turning my attention to running the National Parks in honor of the NPS centennial. I'm calling it Project Run Your Park. I kicked off Project Run You Park earlier this month with a week of family camping and running in Zion National Park. There are hundreds of National Park units and I’ll be lucky if I run a few dozen of them. I won’t always run them fast or even long, but I intend to do the effort justice. I’ll open up my stride down empty canyon roads in the crisp morning air, long before the endless flow of cars trace my path. I’ll jog slowly along some riverside interpretive trail, taking the time to read up on some otherwise unknown factoid. I’ll venture into the wilderness to embrace the majesty we can only experience on our own two feet. To me, the NPS centennial is motivation to connect with these special places during a special year. It’s a time to discover new places and return to the places that have shaped me. Bryce Canyon is a trail running paradise and a wonderful place to get lost. April 2016. Sunset on the C & O Canal National Historic Park. A classic DC run. April 2016. 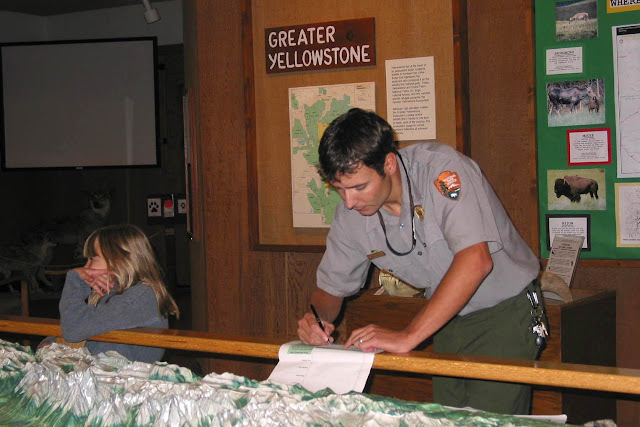 A dozen years ago, as a young Park Ranger working in Grand Teton National Park, I gave a lot of talks about a lot of things: wildflowers, geology, and bears. My favorite talks centered on history and I often encouraged people to reflect on why the National Parks mattered to them. Some nights, with the Teton mountain backdrop and a crackling campfire casting shadows, I could have said anything and the audience would have left inspired. The mountains were always the star of the show and made my job easy. When the faded sunset left alpenglow to illuminate to the stark pinnacles, the towering silhouettes looked down on the campground. At just the right moment, I shared the words of an early Grand Teton National Park proponent who predicted that the park would be “a monument to the men who would help it along, with the Grand Teton as their headstone--that's big enough to fire any man's imagination.” Grand Teton and the hundreds of other National Parks are indeed the legacy of the men and women who helped ensure their protection. They have been set aside for conservation, preservation, and enjoyment and for the past 100 years the NPS has been tasked with upholding that mission. When you get out and experience the parks it's easy to see why they're protected and if you're lucky enough to venture off the beaten path you'll undoubtedly discover why they matter to you. Throwback to signing off on a Jr. Ranger in Moose, Wyoming. Circa 2004. I hope that running the parks this year will bring education and discovery, sort of like a junior ranger project. Inaugurating junior rangers was a daily ritual when I wore the grey and green. Some of those dedicated kids displayed badges earned from National Parks all over the country. I was always envious. So this year, in place of badges I'll collect experiences. I’ll run roads and trails, and places where there is no trail. I’ll visit monuments and wilderness. I’ll run up mountains and through cities. I’ll do my best to avoid traffic, crowds, and wildlife. In exchange, I’ll earn sunrises, sunsets, and summits. If I’m lucky I'll learn why these parks matter and hear the stories of the people who have fought to protect them. Last fall the National Park Service announced that it was encouraging the public to #FindYourPark. It listed 100 ways to do it. Number 74? Run! So as I #RunYourPark this year, I hope others can find their park too. Get out there, take a run, and see why the National Parks are worth supporting. In recent years there has been considerable rhetoric thrown around threatening the very existence of public lands. As trail runners who value these places, it's important that we recognize that they must not be taken for granted and do our part to ensure that they'll be protected for our enjoyment into the next century. I’ll be posting occasional updates from my adventure at www.montanatrailcrew.com and will be sharing photos along the way via Instagram tagged #RunYourPark and #montantrailcrew. So if you’re up for sharing your own experience running the parks this centennial through words or images, tag it or let us know about it and I'll post it in my MTC Weekly News column or through Montana Trail Crew social media. By experiencing and demonstrating that we support the National Parks and other public lands we can do our own little part to help ensure that they'll be around for another century.